Johnston & Murphy traces its origins to the Wm. J. Dudley Shoe Company, founded in 1850 in Newark, New Jersey by Wm. J. Dudley a shoemaker from England. The Wm. J. Dudley Shoe Company specialized in well made, highly durable shoes for men, women and children. Dudley’s company grew so quickly that between 1850 and 1875, it relocated fives times to increasingly larger quarters. In 1880, Newark businessman James Johnston joined the business as Dudley’s partner. Johnston’s plan was to add product lines and grow the distribution channels of the already successful company. The company built the durability of its work shoes into a line of high fashion footwear. In 1881, Wm. J. Dudley died and Johnston assumed control of the company, which was renamed the James Johnston Company. In 1884, Wm. A. Murphy, another prominent Newark businessman, became Johnston’s partner. The company was known henceforth as Johnston & Murphy. In 1895, Murphy sold his interest in the company to Herbert P. Gleason, a former top salesman for the company. Gleason and his son George, continued to grow the company under the Johnston and Murphy brand. In 1951, the company was sold to Genesco. Shortly thereafter, Genesco closed the Newark plant and moved all operations to its headquarters city of Nashville, Tennessee. 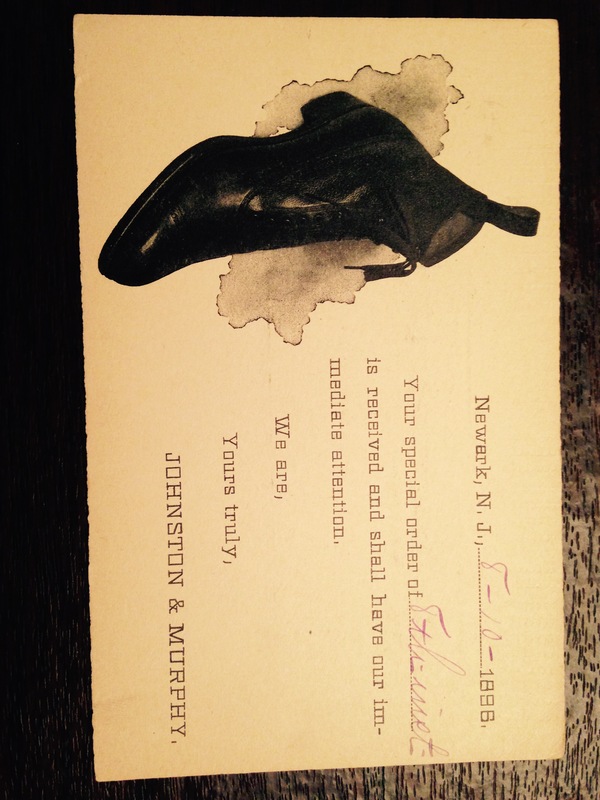 The post card in this posting was sent shortly after the Gleason’s took control of the company.